I’ve been researching and writing about agriculture drone solutions since early 2012. I recently came across this OpEd in PrecisionAg titled “Opinion: The Agricultural Drone War Is Over, And They Lost” and read it with great interest. Two and half years ago, our research indicated the same thing—that small drones might not be able to deliver more usable data to a farmer or provide a cost benefit over the existing image solutions available to them. Even last year I had my doubts. In our June 2016 report, The Truth about Drones in Precision Agriculture, we looked at how drones have been used as remote sensing devices in agriculture thus far, reviewed competitive and traditional approaches using incumbent technology (like satellites and manned aircraft), and discussed the opportunities and challenges posed by the technology itself. But a lot has changed since then. Agriculture drones have matured, and so have the sensors and analytical solutions that support them. A rising number of software vendors are targeting the agriculture space with increasingly useful solutions. And a new generation of drones is delivering much needed functionality. Can you get all the components—drone, sensor, software, and analytics—from one company? Is an internet connection required in order to process data? Will it integrate well with your existing tools? Nearly all agriculture drone solutions process RGB color, near infrared (NIR), and normalized difference vegetation index (NDVI) data. But not all solutions provide additional analytics and tools better matched to the needs of growers and agronomists. 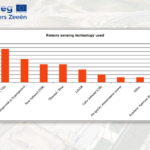 For example, only one solution we know of in the market allows users to view live NDVI data via streaming video while the drone is flying without an internet connection. This means you can more easily fly missions and see critical information at the field’s edge without requiring a trip back to the office. This eliminates a huge bottleneck. Most solutions require that you upload images from the UAV to a mobile device, a laptop or cloud service where they are stitched together to create a base map and the underlying spectrum data is processed into a usable NDVI layer. In most solutions, you have to wait for that information—sometimes for hours. But with this solution you don’t have to do that, and the added benefit is you can use the time savings to gather additional inputs from the areas the real-time map shows as suspect. 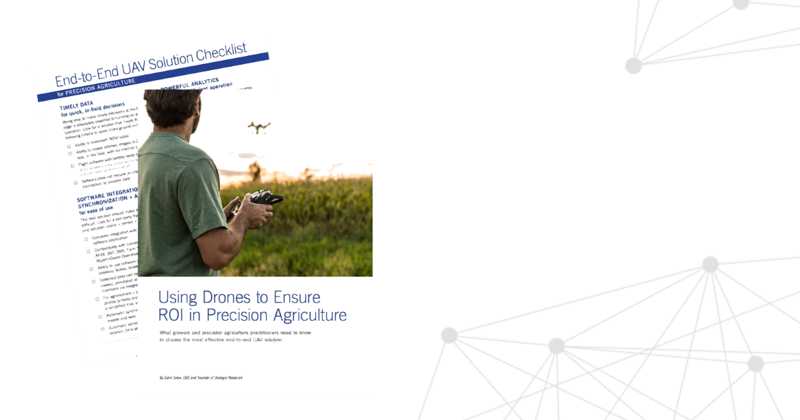 You can get the report, plus an End-to-End UAV Solution Checklist for Precision Agriculture, here.